Cigars are considered a national pride in Cuba. Cigar exports are one of Cuba’s main exports items with sales worth 368 million dollars in 2010, according to the Cuban-Spanish cigar company Habanos SA. 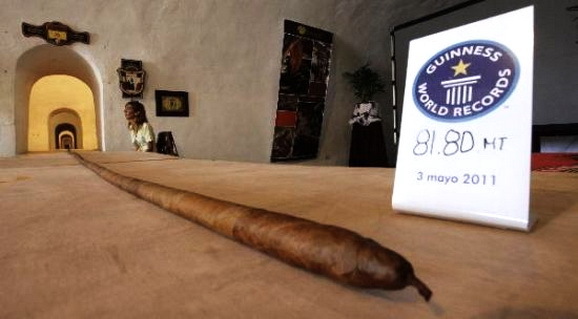 The 67-year-old Cuban cigar roller Jose Castelar, on Tuesday set a new Guinnes Record when completing a massive cigar measuring 81.80 meters long and 4 centimeters in diameter. The huge cigar is being exposed at the International Tourism Fair “FIT Cuba 2011” which runs from May 3 to 7 and Castelar said his next project will be to roll a cigar measuring 100 meters. “The next one will be 100 meters long. Cuba is the country where the best tobacco is grown, and as long as Cueto lives the longest cigar will be here too,” he said, referring to his own popular name as “el Cueto” which means someone whose achievement can not be surpassed. The measuring ceremony were overseen by British diplomats who served as official witnesses for the approval of the Guinness record of the Castelar, who with Tuesday’s cigar broke his own previous record of 60 meters from 2009. Castelar first made cigar hisotry when he in 2001 made a cigar measuring 11.04 meters, a record he has broken for three times later with 14.86 meters in 2003, 20.41 meters in 2005 and 45.38 meters in 2008, all of which were certified by the Guinness book of records. Castelar began to roll cigars at the age 14 in his native province of Villa Clara in central Cuba and says he “never” thought it was possible to make a cigar this long” as he wanted to learn to master the skill of cigar making as “an art”. Previous Previous post: Russian analogue of Apple iPhone. 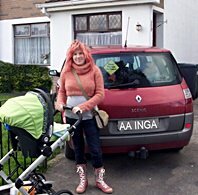 Next Next post: Happy Mother’s Day.